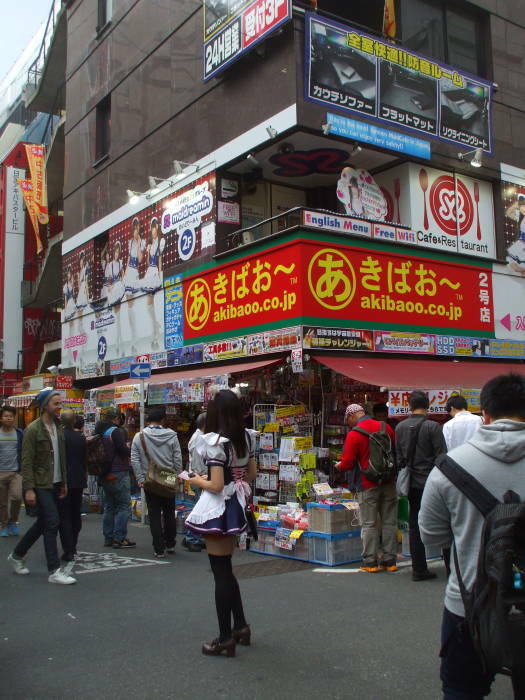 Akihabara is a famous center of otaku lifestyle and electronics. 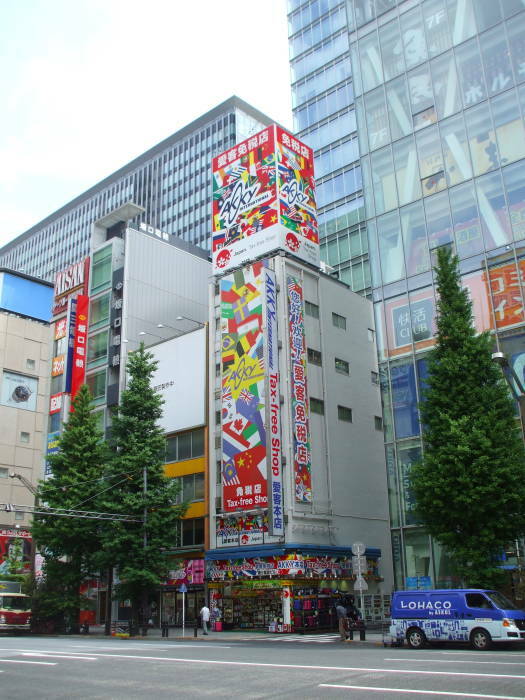 It is centered on Akihabara Station, which has multiple train and subway lines. 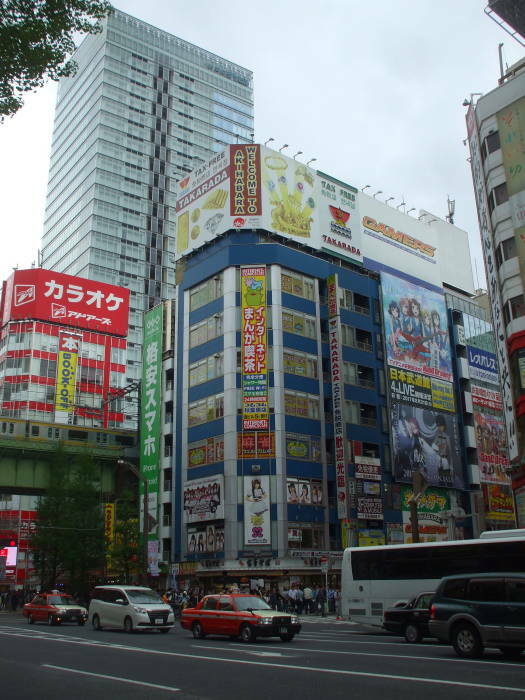 The core of Akihabara is on the west side of Akihabara Station, just north of the Kanda River. 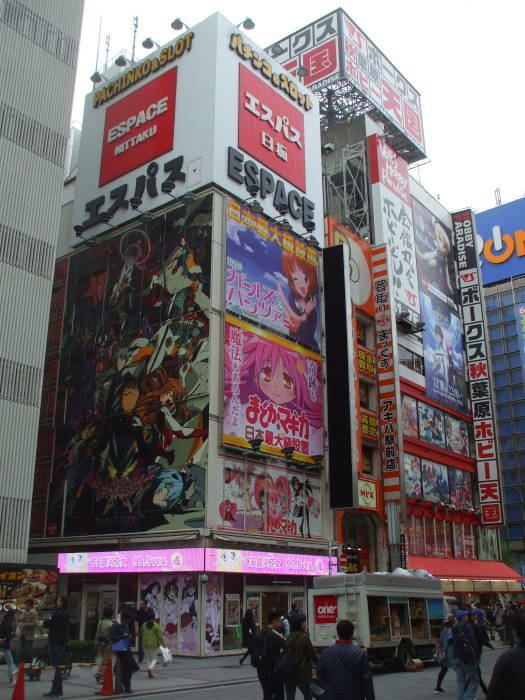 Otaku (that is, おたく or オタク) refers to someone with obsessive interests. 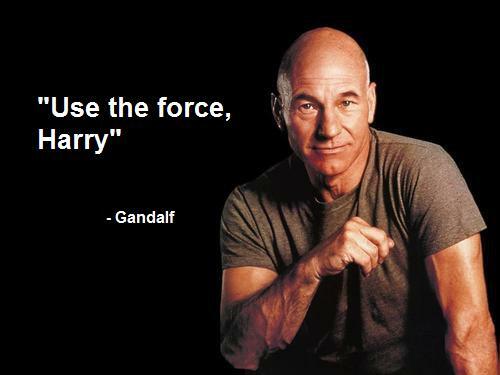 It's roughly like fanboy or nerd or geek but with more negative connotations when used by an outsider. 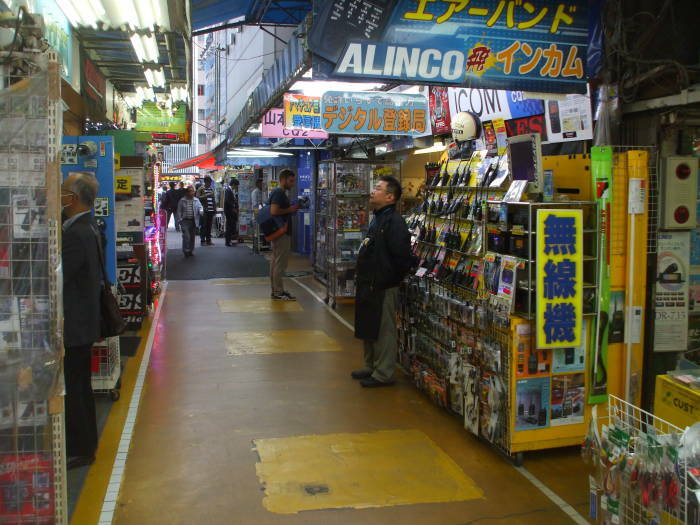 Stores sell video games, anime and manga and related items, appliances, and all sorts of electronics. 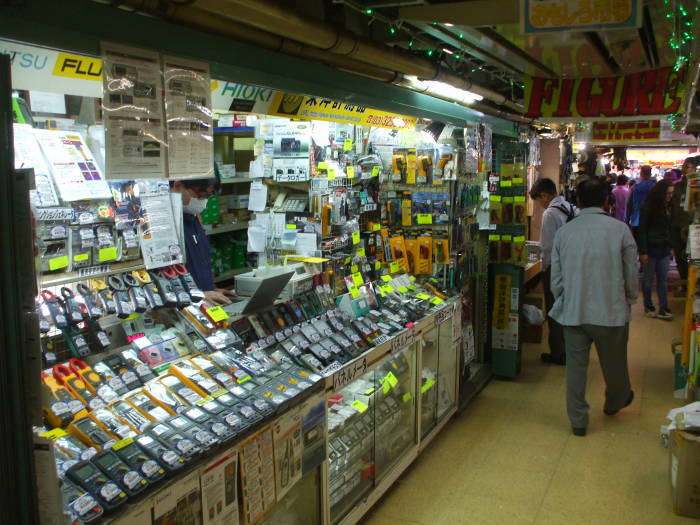 Along with electronic systems such as computers, DVD and Blu-ray players, radios, and television, Akihabara also has shops selling electronic components and tools. 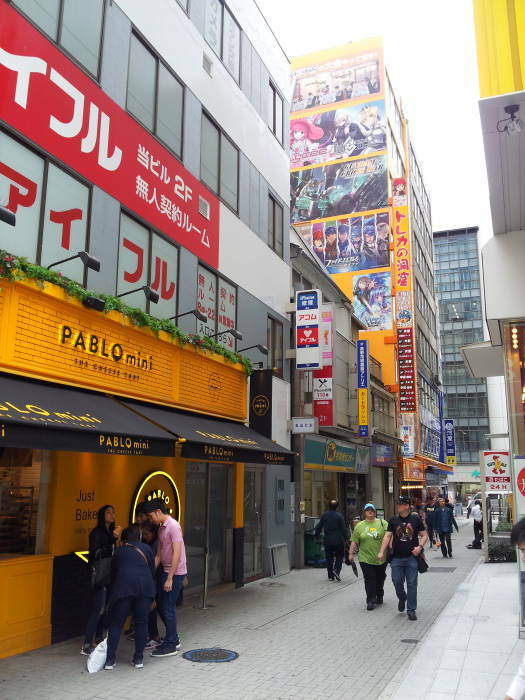 There are also maid cafés and cosplay shops where you can buy costumes or just rent them for the day. 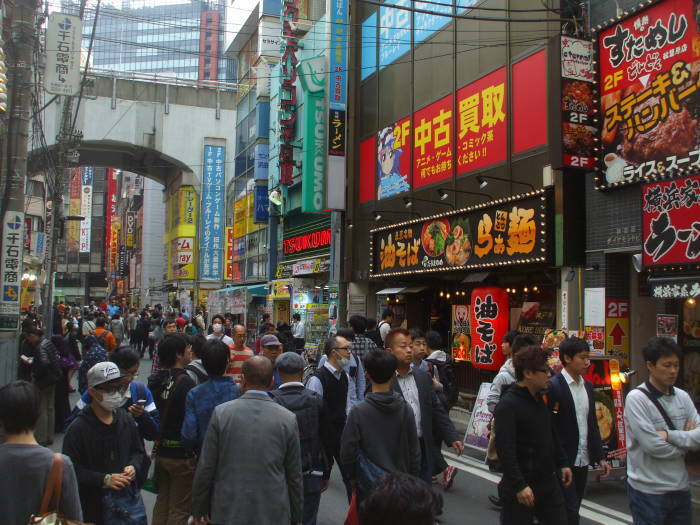 Akihabara is easy walking distance from Ueno to its north, walking south through the Ameya-Yokochō market area. 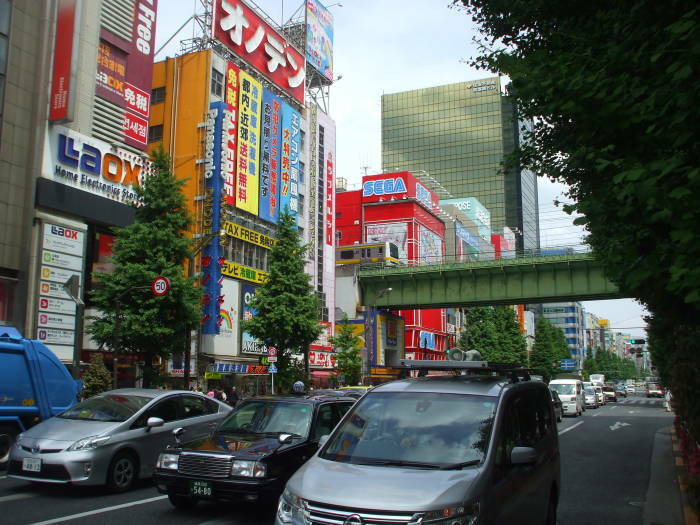 It's just a little further from Asakusa to its northeast, and the Imperial Palace area to its southwest. 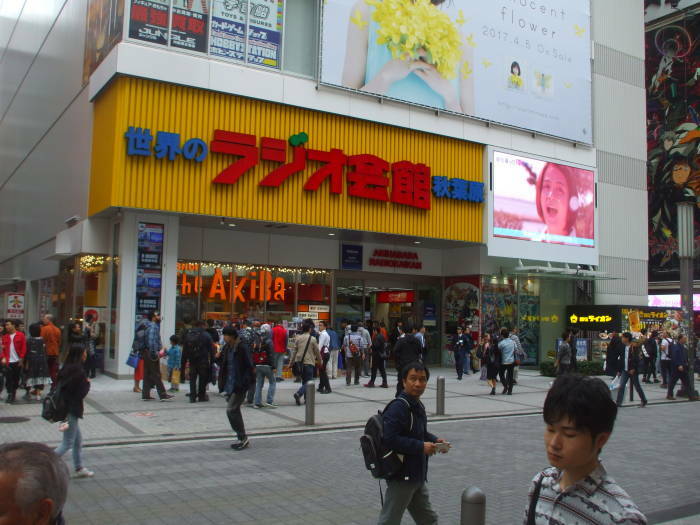 Plus, Akihabara station has service on several lines. JR lines at Akihabara Station include the Yamanote Line and Keihin-Tōhoku Line running north-south, and the Chūō-Sōbu Line running east-west. The Tōhoku-Joetsu Shinkansen line also passes through north-south. The Hibiya Line of the Tōkyō Metro passes through north-south underground. The Tsukuba Express starts here, running underground to the north toward Tsukuba. Below you see the multiple levels of transport. I'm on the sidewalk at street level. 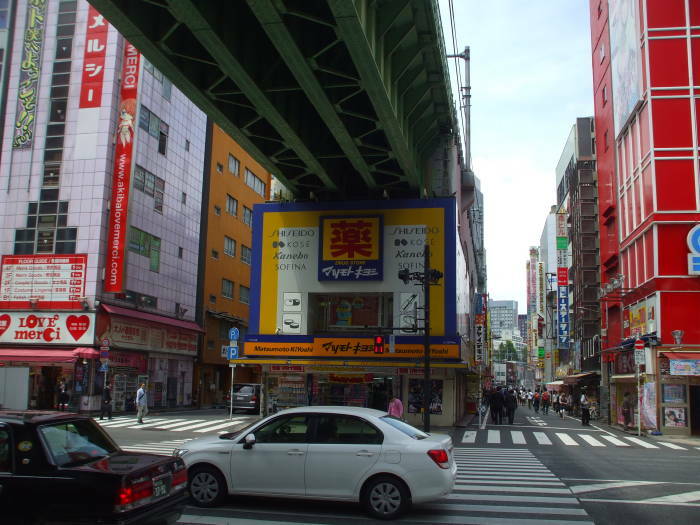 An elevated expressway runs above the street. 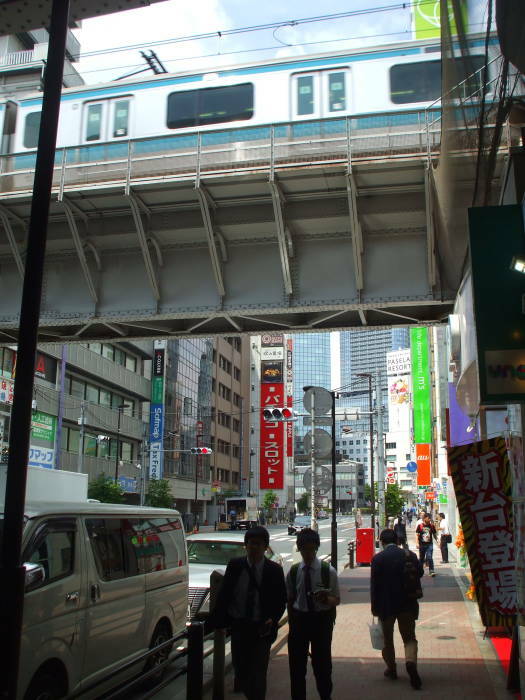 And above that is the Chūō-Sōbu Line on the third level. Especially at night, the multiple levels of lighted high-speed transport can be very reminiscent of Ghost in the Shell and other anime. 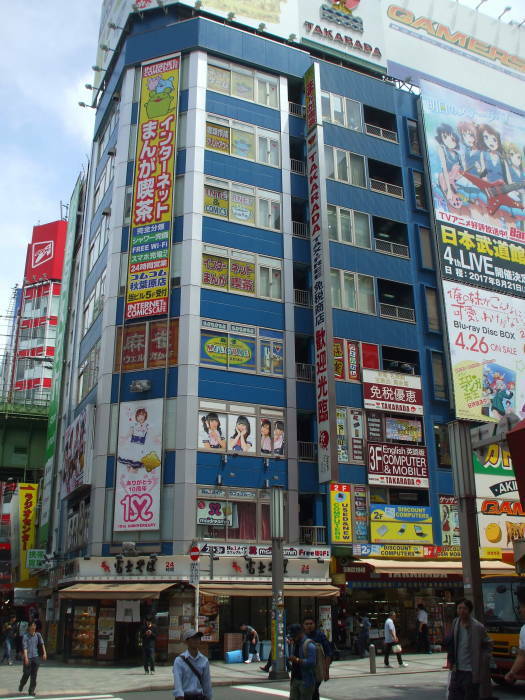 When I was staying at Nui Hostel on the south edge of the Asakusa district, I simply walked from there to Akihabara. 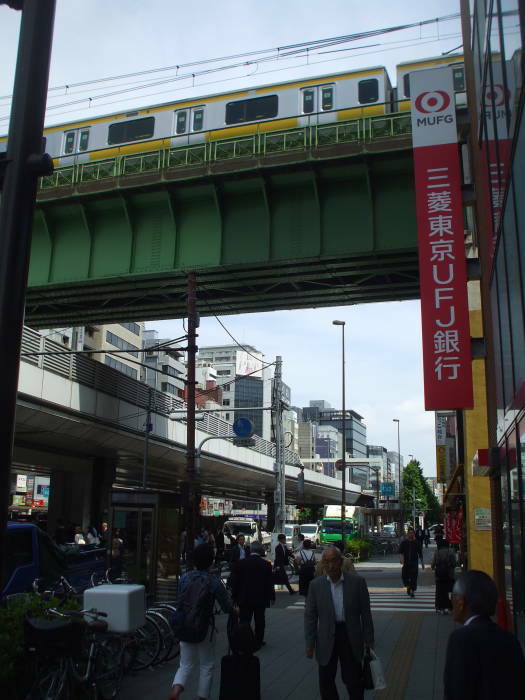 I went south to the elevated Chūō-Sōbu Line, running parallel to and just north of the Kanda River. 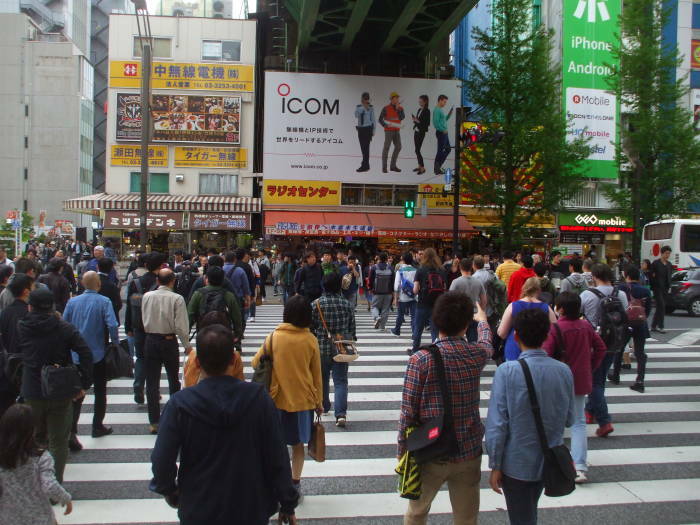 Then I turned to the west and followed that line to Akihabara. 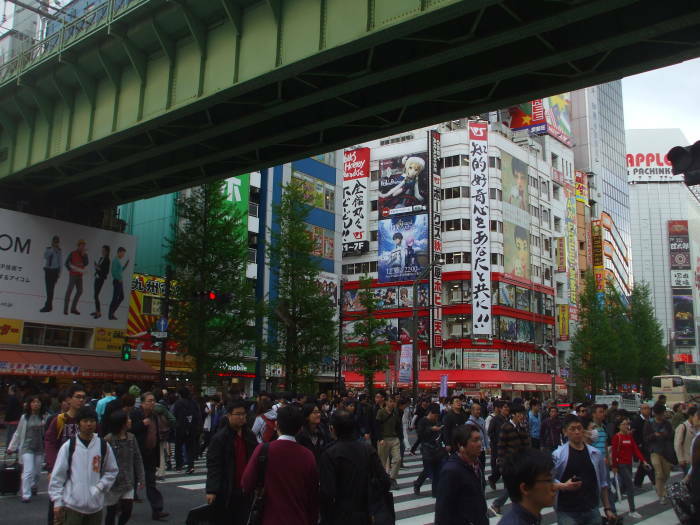 In the last picture above I'm passing under the elevated Yamanote Line. 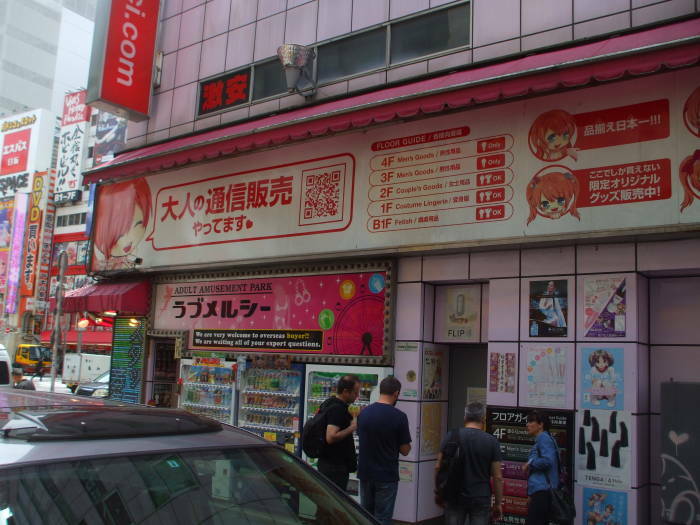 The core of Akihabara is directly ahead. 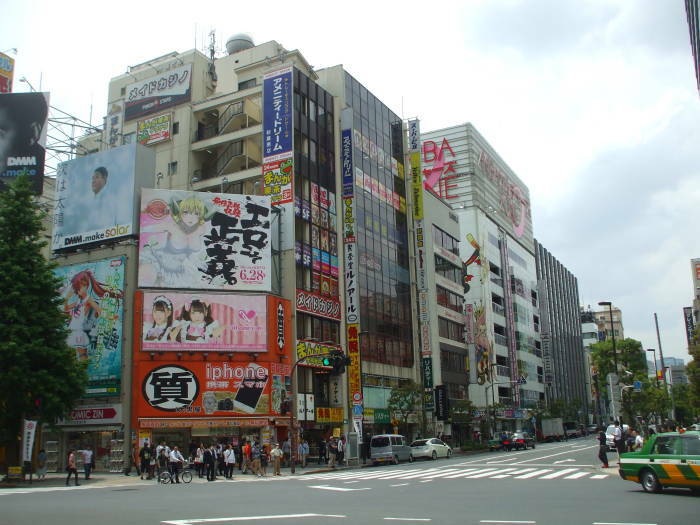 Akihabara lies within Chiyoda ward, the core of Tōkyō and, since the start of the Edo period, of Japan itself. Tokugawa Ieyasu established the Tokugawa Shōgunate in 1603, based at a fortified palace inland from the fishing village of Edo. 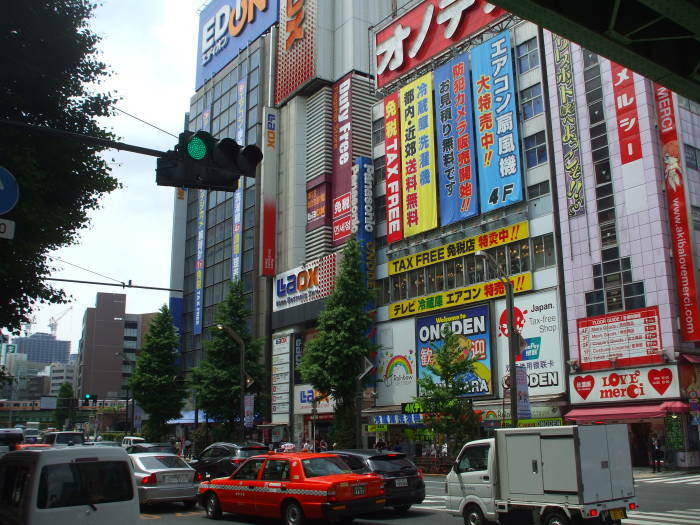 Edo grew into the largest city in the world, with a population over one million by the early 1720s. In 1853, U.S. Navy commander Matthew Perry led the "Black Ships" fleet to Japan. Japan had been isolated for centuries. Perry demanded that Japan open its ports to foreign ships. A series of treaties beginning in 1858 opened Japanese ports first to U.S. ships and then to ships from other nations. The Shōgunate had failed to repel the foreign invaders. Japan looked at China's recent experience against Britain in the Opium Wars. Confidence in the Shōgunate dropped. In November 1867 the last Shōgunate was terminated. Power returned to the Emperor, the descendant of the gods, in January 1868. That was the Meiji Restoration. 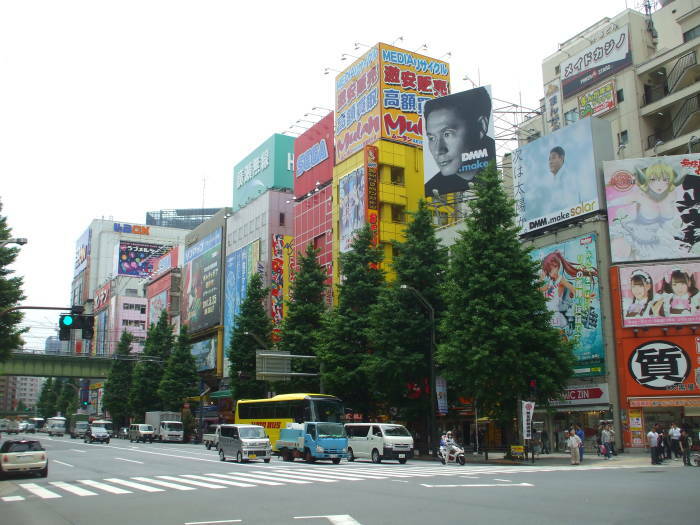 In 1869 the Emperor moved his court to the Shōgun's city of Edo, now known as Tōkyō, the Eastern Capital. Chiyoda Castle, also called Edo Castle, had been the home of the Shōgun and became the Imperial Palace, the home of the Emperor. Matthew Perry's U.S. Navy expedition of 1853 forcibly opened Japanese ports to western trading. The Shōgun fell and the Emperor returned to power. Buddhism was suppressed in favor of Shintō. The cult of the divine Emperor grew in influence. Japan invaded Manchuria in 1931, leading to the Pacific theatre of World War II. Be careful about aggressive international trade actions. They may not turn out the way you hope. Chiyoda ward is roughly a circle centered on the Imperial Palace with a radius of about a kilometer. It includes the National Diet, the Prime Minister's official residence, the Supreme Court, the Yasukuni Shrine, Budokan, and Tōkyō Station. 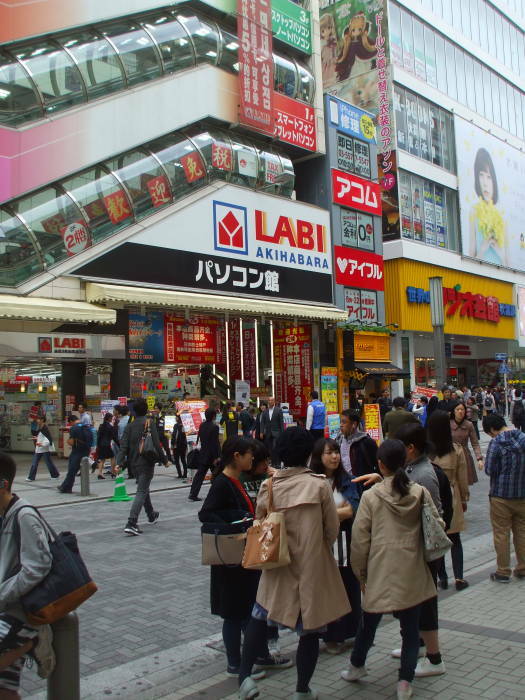 Akihabara lies within Kanda area, the former Kanda ward, where the street addressing system is even more confusing than usual. Which, for Japan, means pretty much impenetrable for anyone who doesn't live within the area. 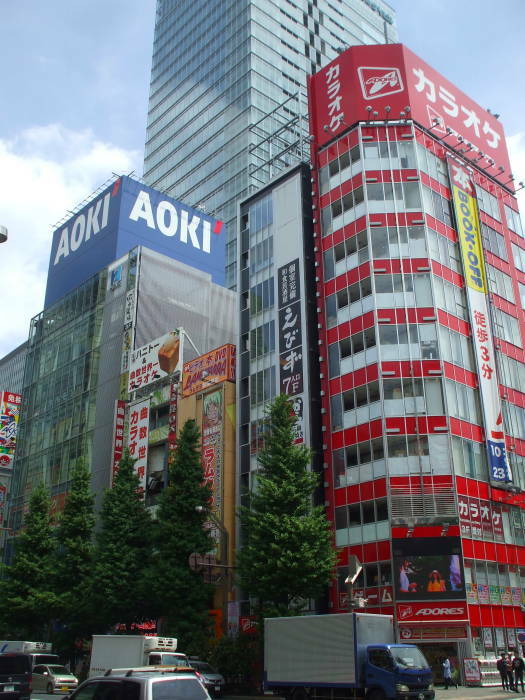 Some of the address districts are just a few buildings, or even just one department store. 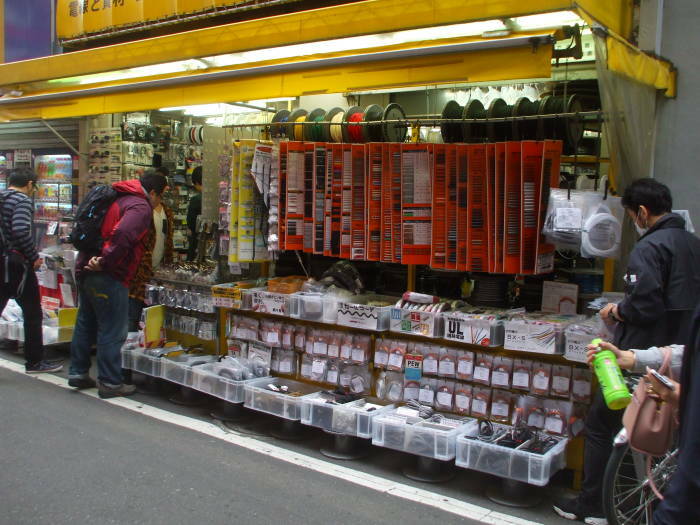 Other times, I either walked south from Ueno through the Ameya-Yokochō market alongside and underneath the rail lines to Akihabara Station. Or, I took the Yamanote Line. 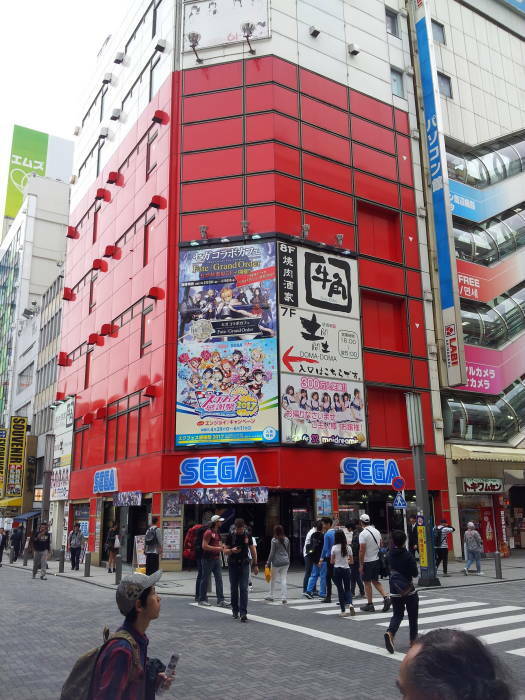 Either way, below is the view exiting the south end of Akihabara Station. 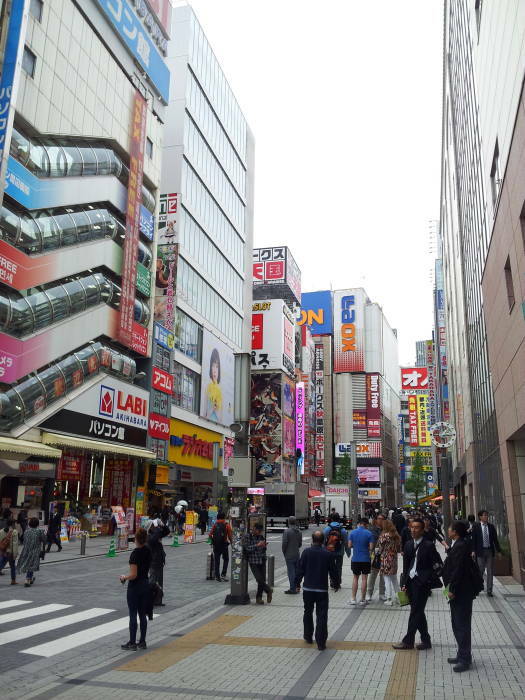 Below, I have turned to the west to walk along the south side of Akihabara Station. 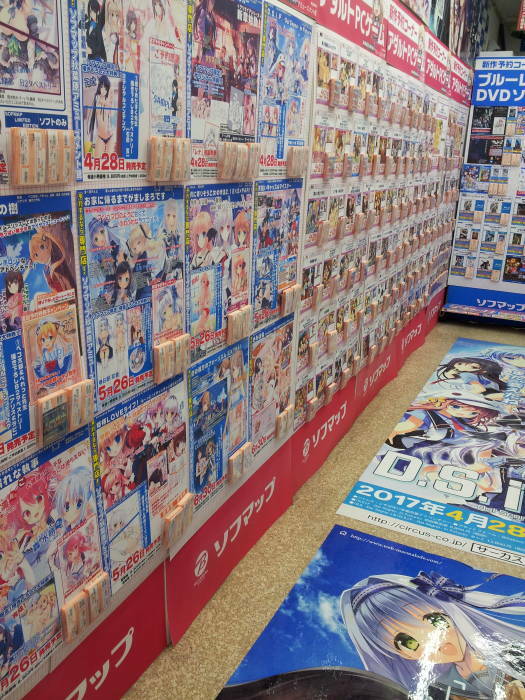 As best as I could tell, the below are cards you take to the counter to purchase a DVD or Blu-ray disc. 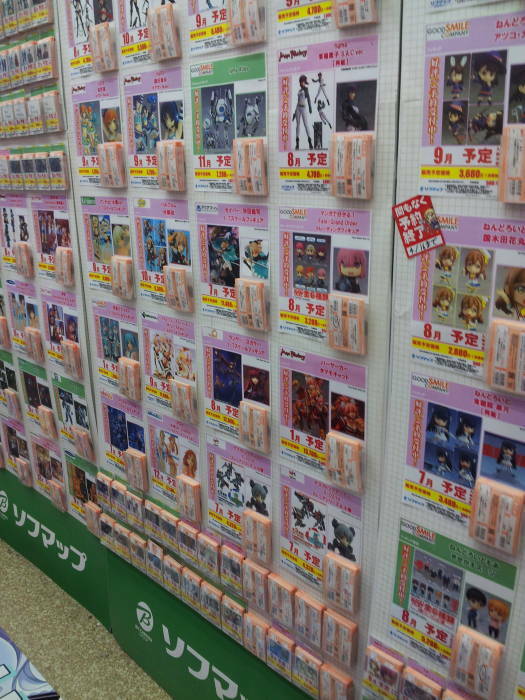 Above, in the same shop, are cards with which you buy a figua or figurine. 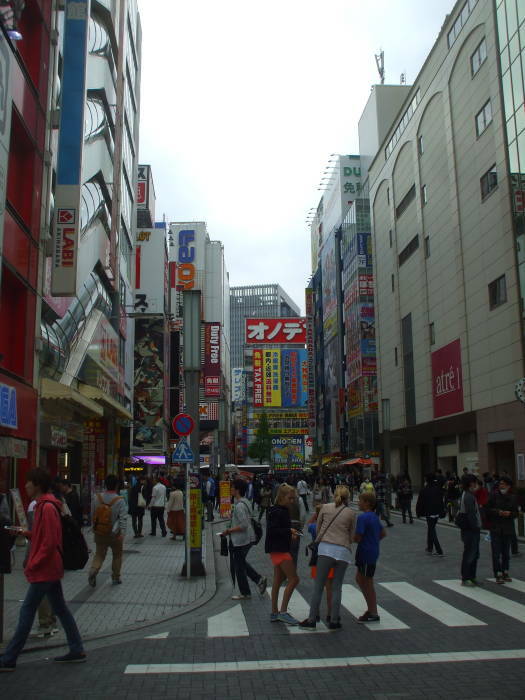 Below, we're looking to the west from the Akihabara Station exit. 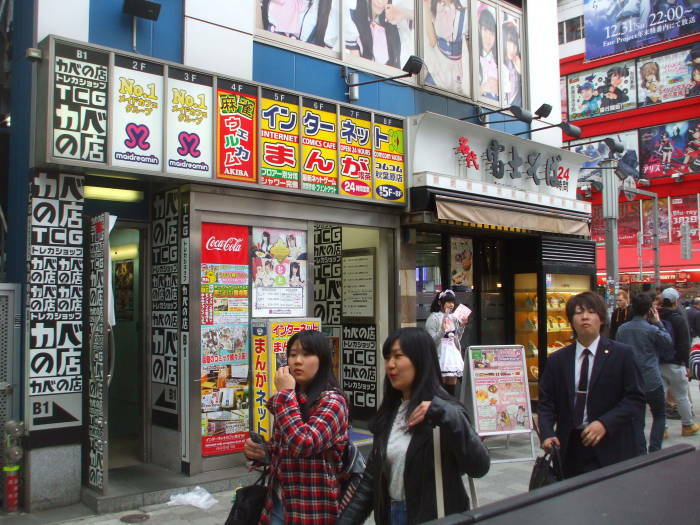 Maid cafés are a special category of cosplay restaurant. 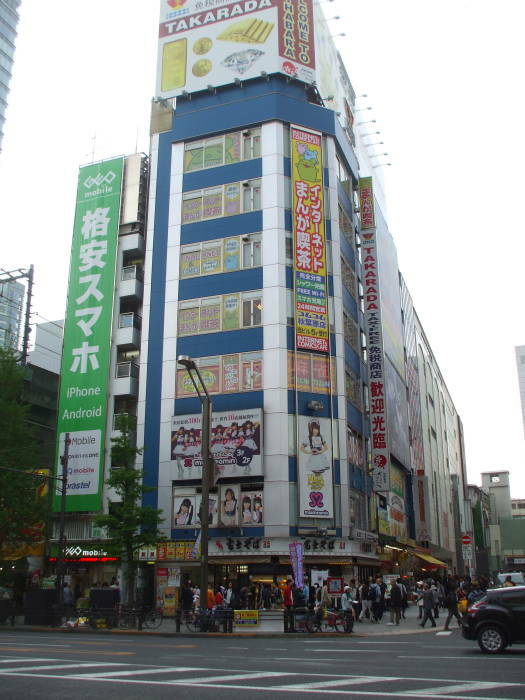 The first maid café, the Cure Maid Café, was established in Akihabara in March 2001. The maid costume is generally based on an archetypal French maid costume, with a dress, a petticoat, a pinafore, stockings, and a matching hair bow or frill. The goal here is moe, in which young, innocent characters cause feelings along the spectrum from attraction to lust. 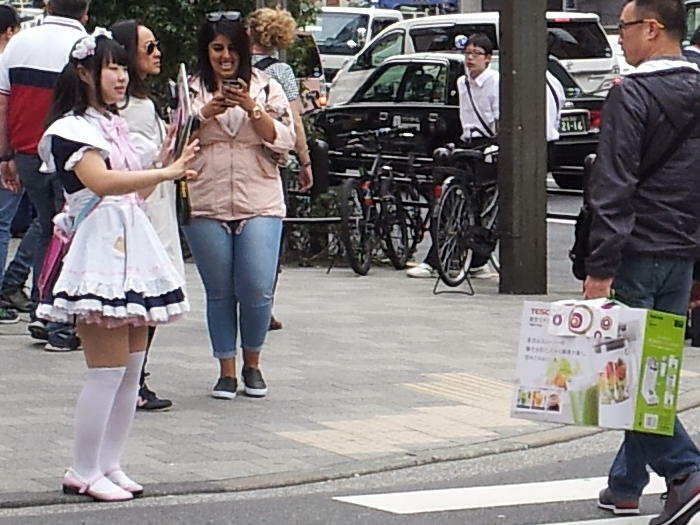 Maid moe is recognized as a narrowly specific moe fetish, in which a male otaku is drawn to an establishment where he can interact with a real-life manifestation of the maid archetype. 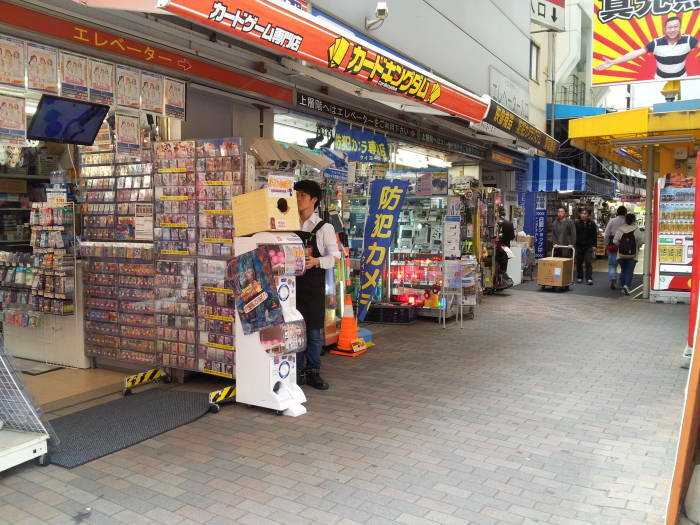 Customers are greeted with high-pitched squeals of "Okaerinasaimasa, goshujinsama! ", or "Welcome home, Master!" See "The Phonetics of Japanese Maid Voice I: A preliminary Study" for an academic analysis of this job-specific speech style. Maids kneel by the table to stir sugar and cream into coffee, and some cafés feature spoon-feeding. Patrons can order coffee, other beverages, and a range of desserts and entrées. The maid waitresses decorate the dishes with extremely cute, or kawaii, designs. Desserts are decorated with chocolate syrup. The popular dish of omu-raisu or omelette rice, オムライス, is typically decorated with ketchup. Think smiley faces, but way more cute or kawaii. OK, so I didn't know about Rule #8 when I took those pictures. But I assumed that all of #1-9 existed. This area was near a perimeter gate of the city of Edo back in Shōgun times. It was home to tradesmen and craftsmen, and some lower class samurai. The area was destroyed by fire in 1869, just after the end of the Shōgunate and the restoration of full Imperial power. The local people built Akiba Jinja, a fire-fighting shrine. 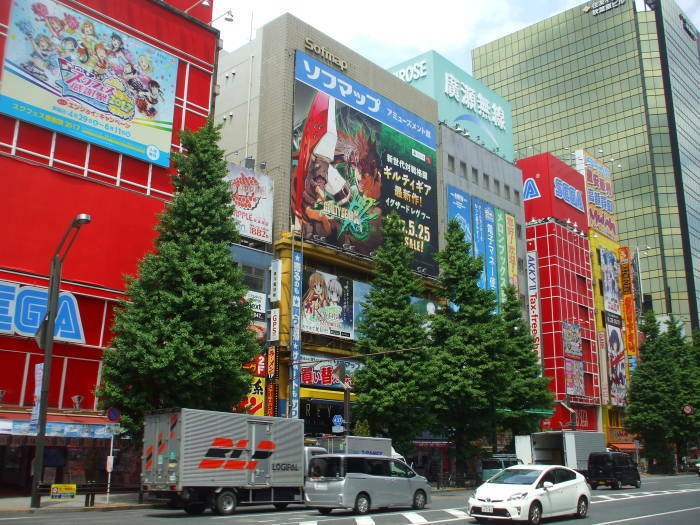 It was dedicated to Akiba, a fire-fighting deity. That led to the place name of Akibagahara, meaning autumn leaf field. 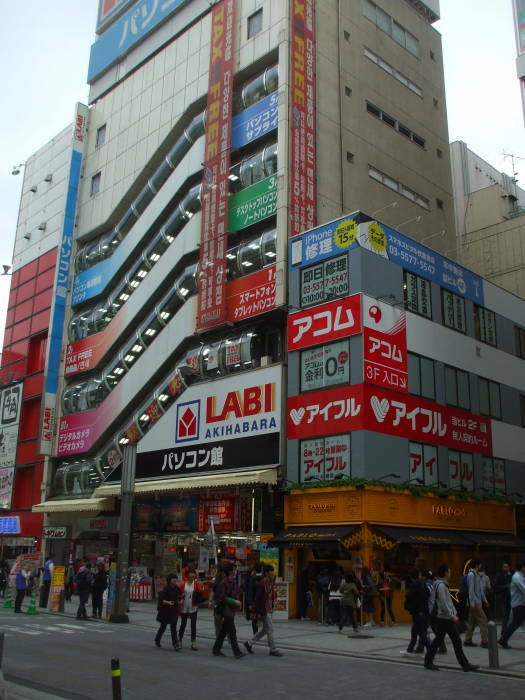 The name Akihabara is a shortened form of Akibagahara. 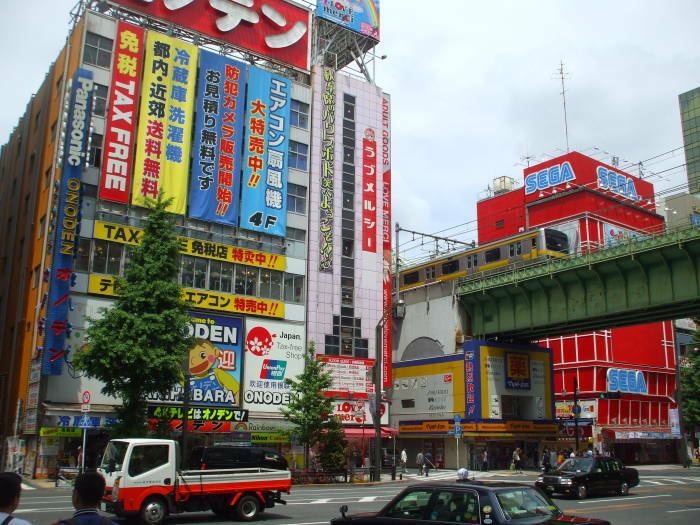 Akihabara Station opened in 1890, and became a major freight transit point. That led to a vegetable and fruit market. Passenger service started here in the 1920s, increasing the local market activity. 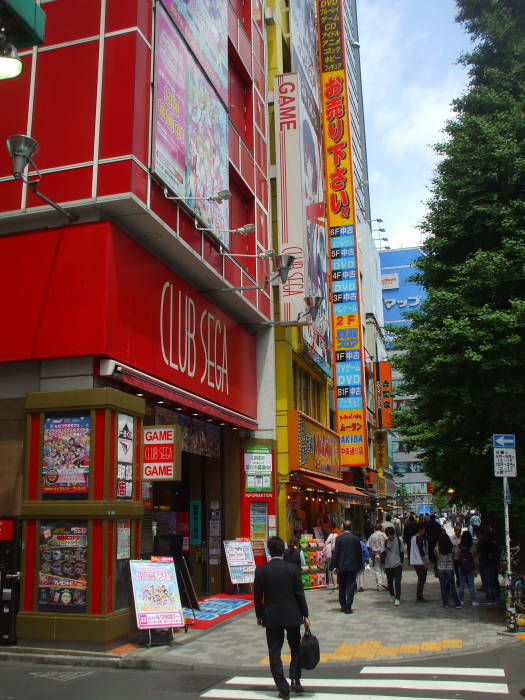 The area became known as Akihabara Denki Gai or Akihabara Electric Town, when local businesses sold washing machines, refrigerators, and radios. The "Electric Town" operation increased after World War II. 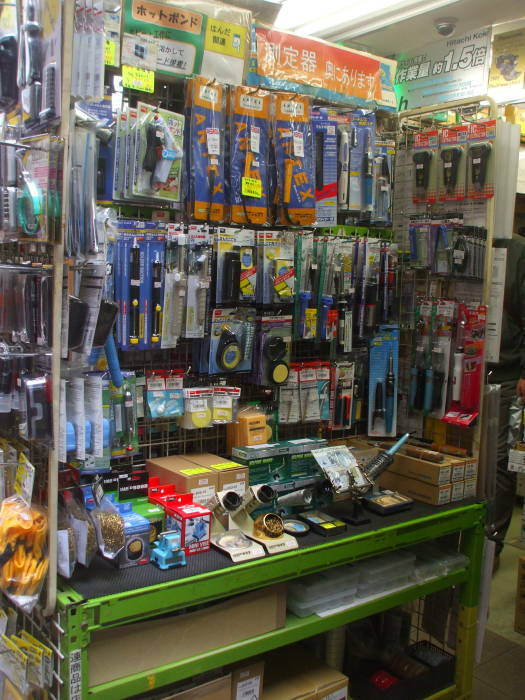 Akihabara was the main place to buy household electrical items. It was also the locus of the postwar black market. 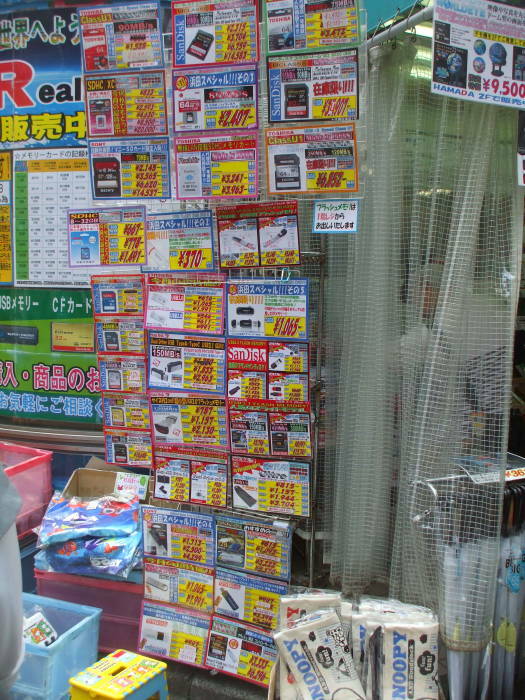 Stereos and television sets eventually appeared on the local market. Household appliances and radios and television sets were no longer modern novelties in the 1980s. 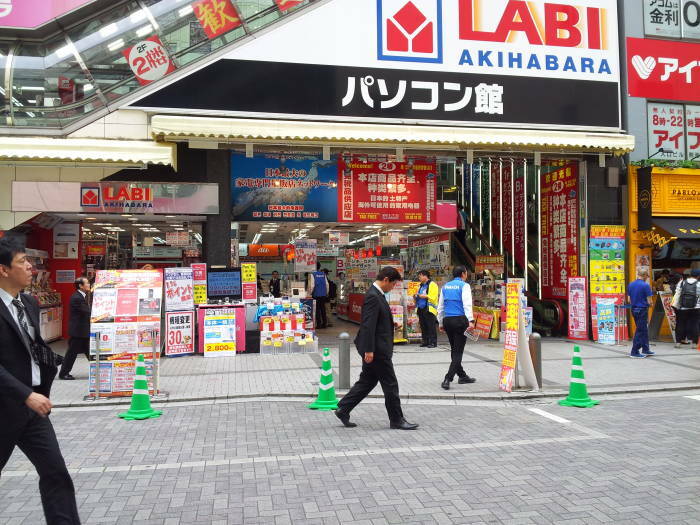 Akihabara moved to new distinctive product lines. Computers were only used by technical specialists and advanced hobbyists in the early 1980s. 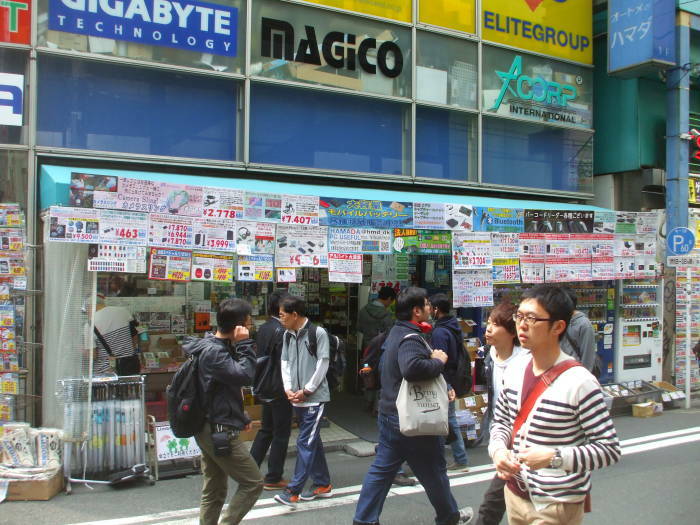 The Akihabara shops began selling what previously had been exotic items. 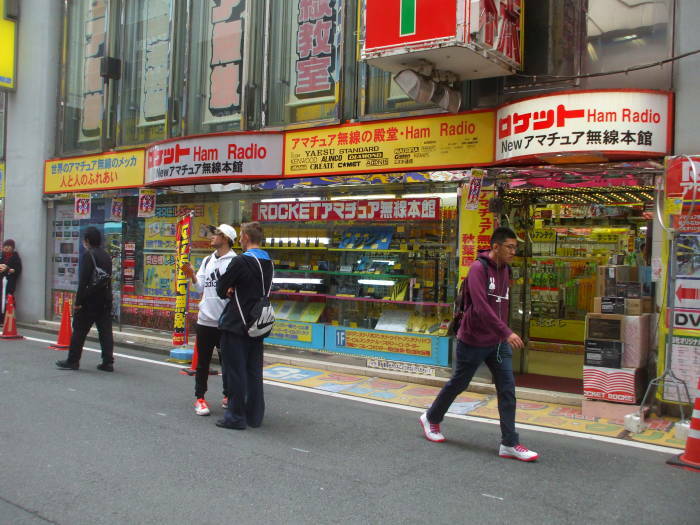 Let's head into the Electric Town indoor arcades. 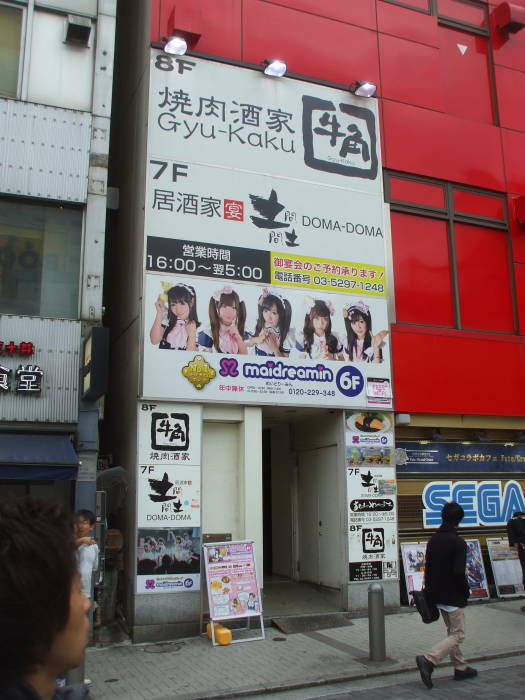 They are clustered west and south of Akihabara Station. There are tools, components, and entire systems. 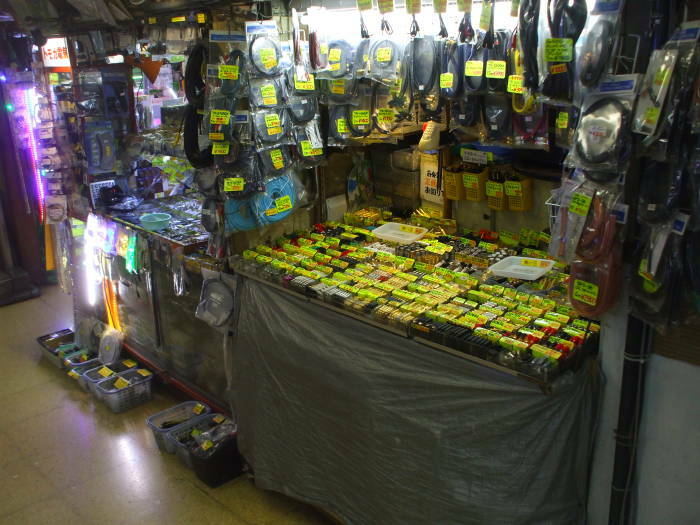 Some places are as specialized as this booth where they sell nothing but capacitors. They carry a wide range of capacitance, voltage rating, temperature rating, chemistry, and form factor. 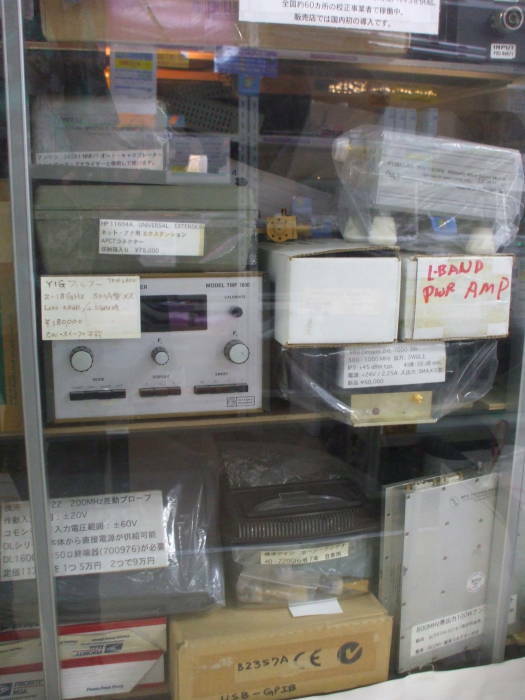 Other booths specialize in transistors. Others in light-emitting diodes. Others have nothing but transformers. 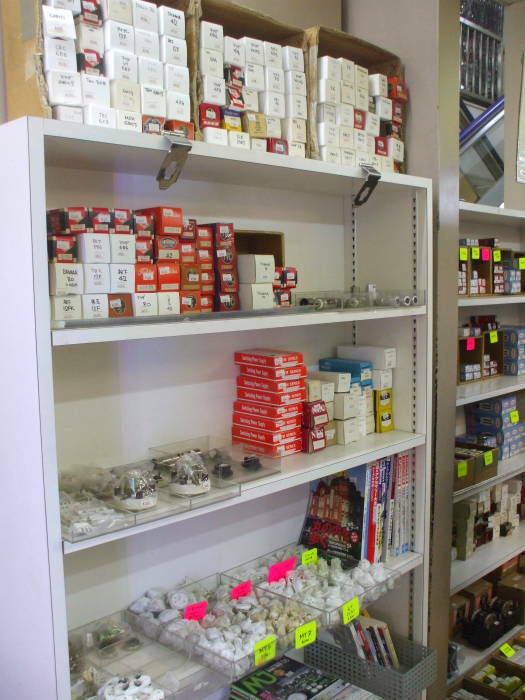 The shop above has nothing but controls, knobs, and connectors. Below: connectors and pre-made signal cables. 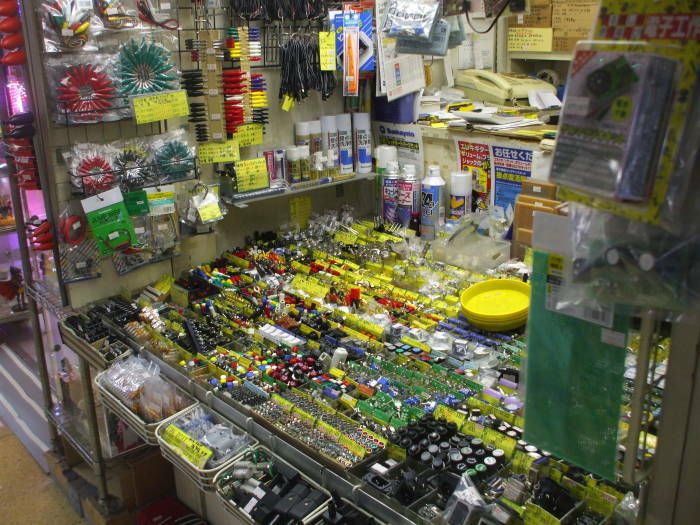 The shop above has nothing but wires and cables. Electrical, RF signal, and data cables. 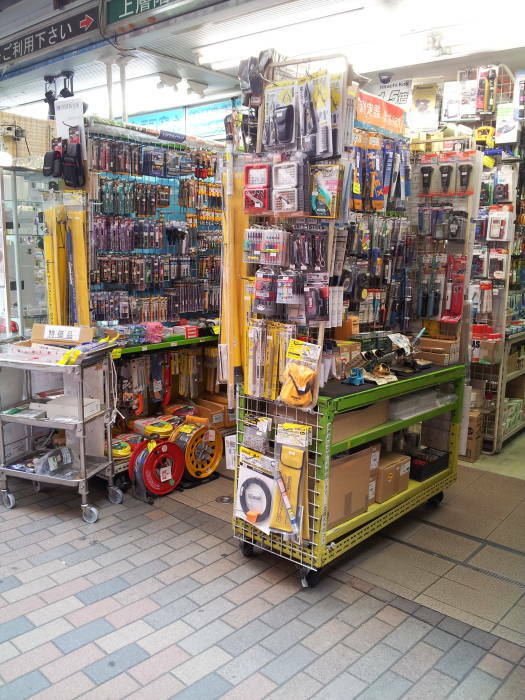 Shops like the ones below are dedicated to network cabling. They have Ethernet switches, fiber equipment, and routers, and the racks in which to mount them. 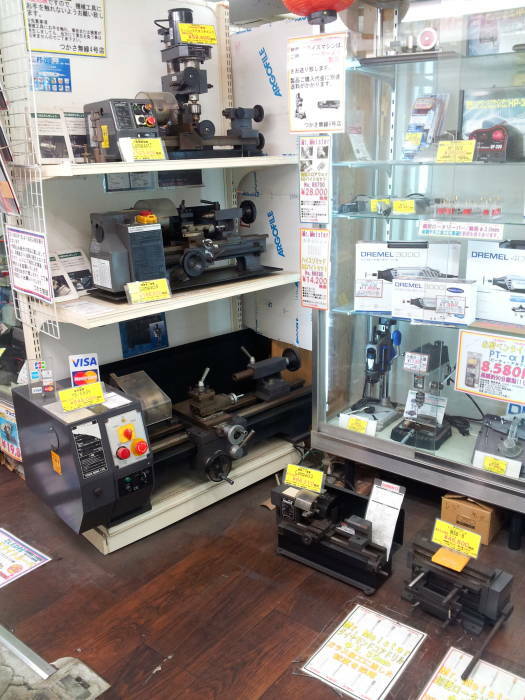 Akihabara is famous for electronic and electrical components and equipment, but there are also some machine tools. Below are some combining the functions of lathe, mill, and drill press. 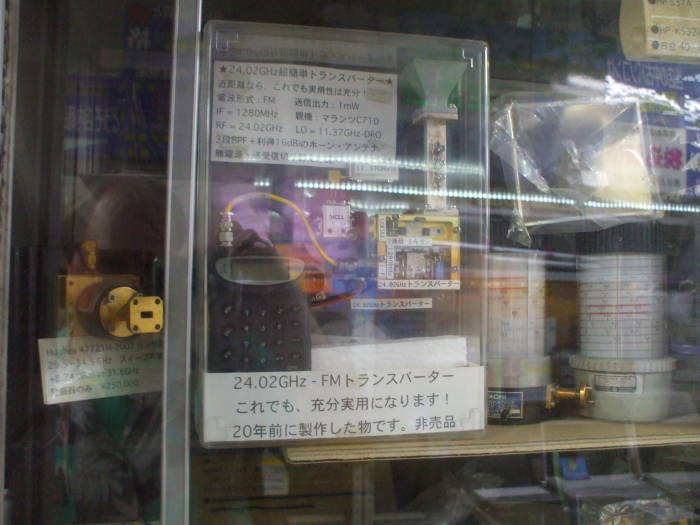 For ham radio equipment in particular, go to the main north-south street to the west of Akihabara Station, then go further west under the rail line. One place sold antennas from relatively small UHF Yagi and discone antennas, ranging in size up to HF triband and single-band beams. 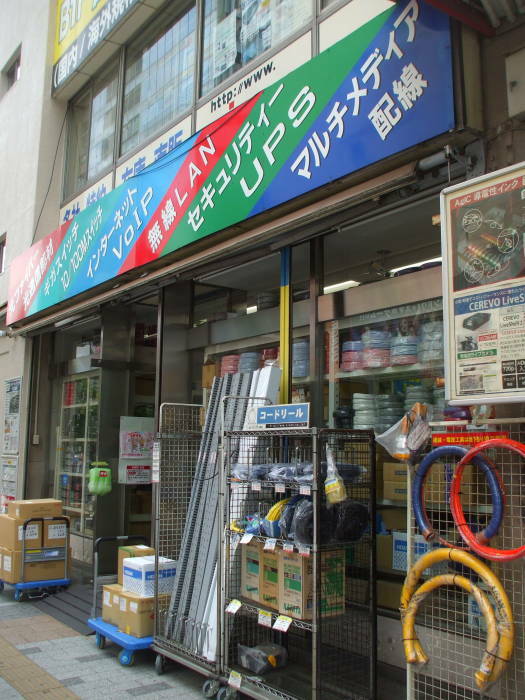 It seemed like there was a kilometer of aluminum tubing and rod in that shop. 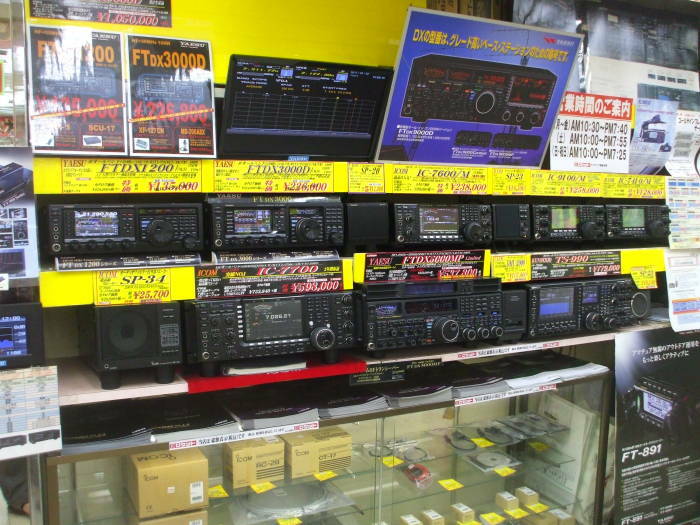 Above are Yaesu, Icom, and Kenwood high-end transceivers. Also look through the indoor arcades. 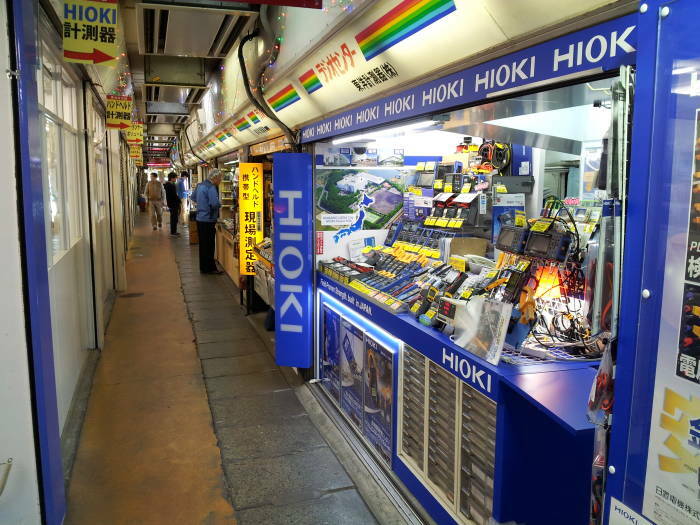 There were shops selling handheld VHF/UHF FM transceivers. 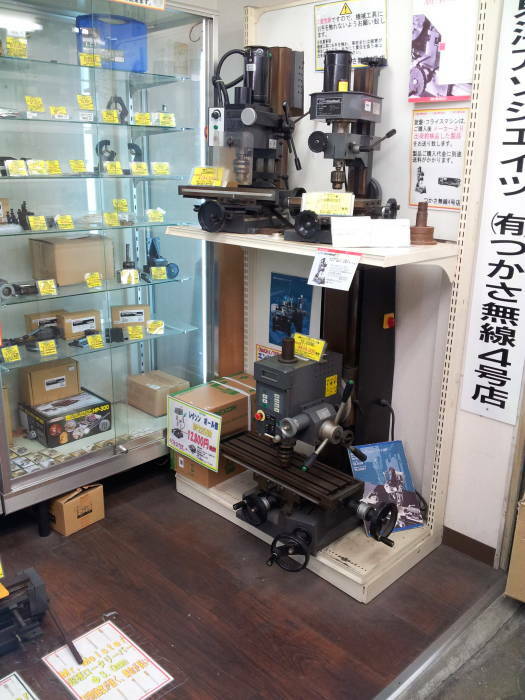 Below is a very small shop, really just a booth, with 10 GHz and 24 GHz equipment and test gear. 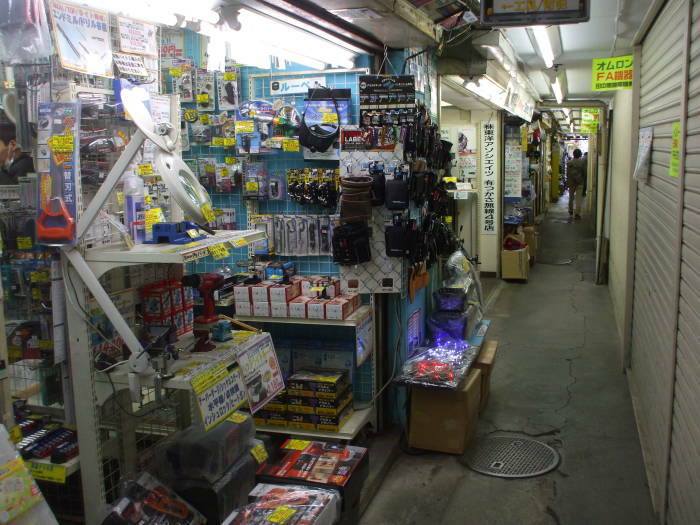 Or, for the really classic equipment, some shops in the indoor arcades specialize in vacuum tubes. 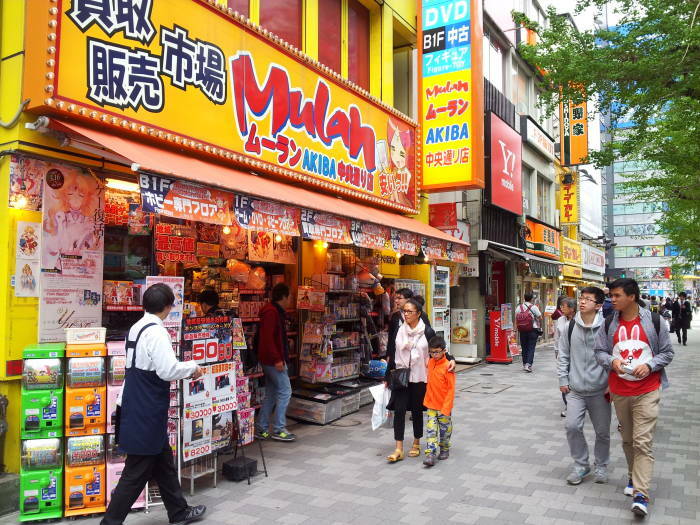 You see "Tax Free" on a lot of businesses in Japan. It seems to really mean "Discount", which in turn doesn't really mean anything concrete. 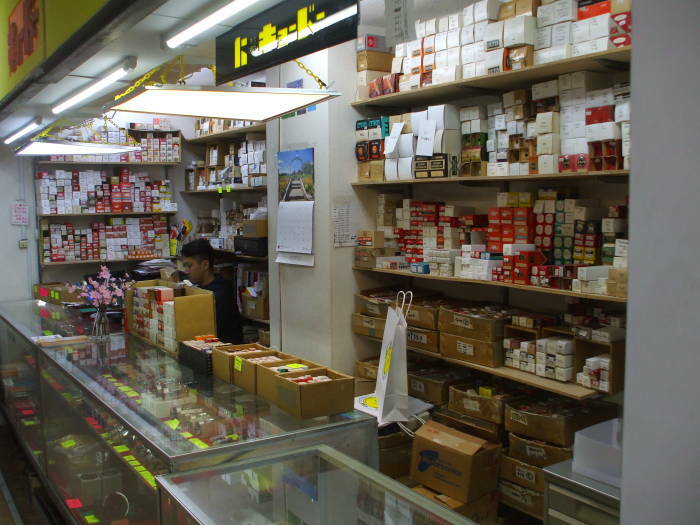 Businesses are squeezed into every available space. This three-level complex forms the support for the elevated east-west Chūō-Sōbu Line. 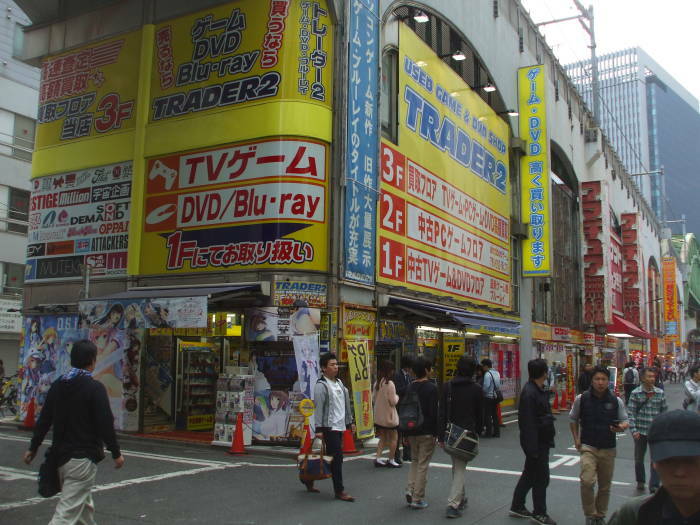 And, yes, several places sell sexually oriented media, clothing, and equipment. 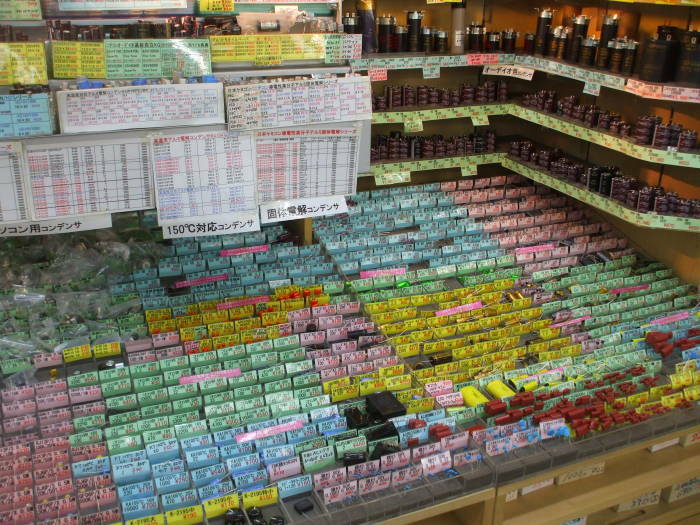 This is fairly casual in Japan, simply another category of business mixed in with the others. Unlike in the southeastern U.S., where the adult book stores are garishly lit compounds along the expressways running through and around cities. 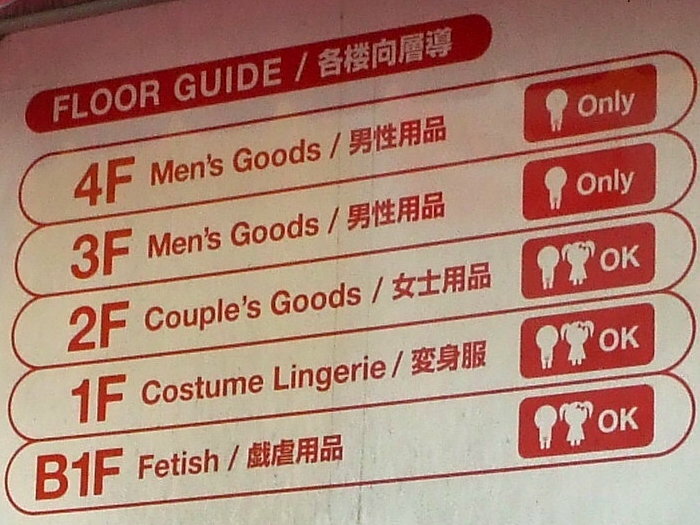 The signs tell us not to take little girls up to the top two floors with "men's goods". Otherwise it's all fine for kids. Unless... are those extra-kawaii icons for men and women? I don't know what's going on. 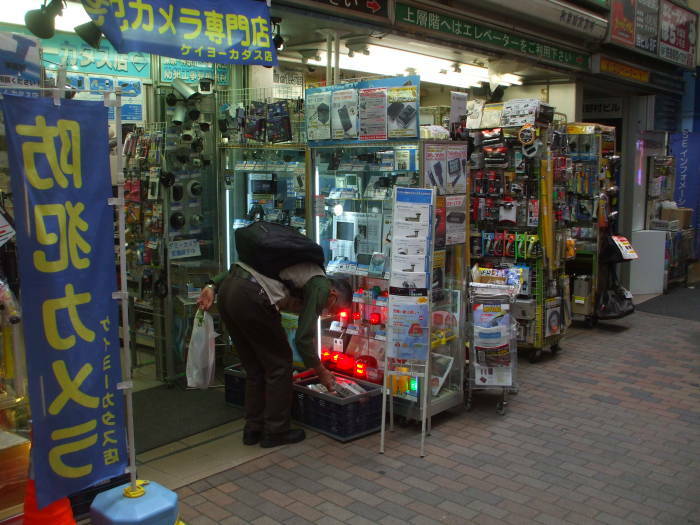 There are still stores selling appliances in Akihabara. Clothes washers and driers, toaster ovens, rice cookers, and instant pots. Plus, of course, the multifunction toilet seats with built-in bidet functions. 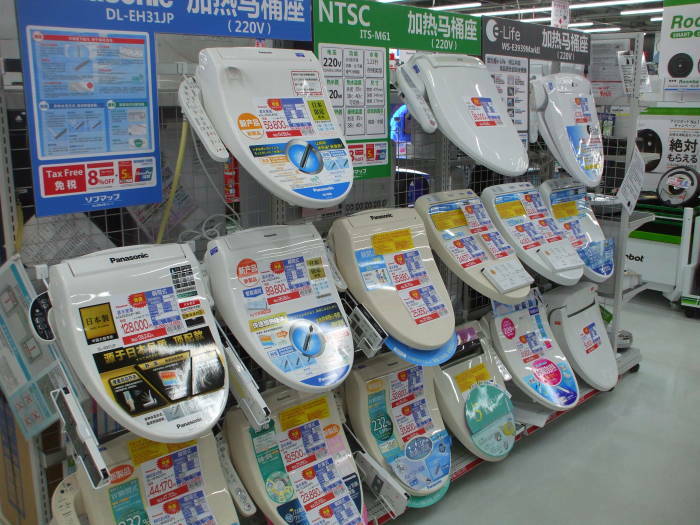 See the pages on my other site for details on complex multi-function Japanese toilet-bidet systems. 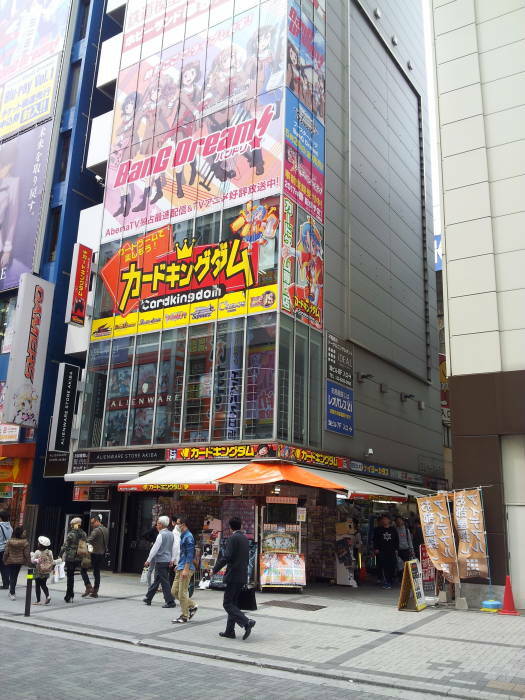 This store had seven floors, with appliances, DVD/Blu-ray anime, used DVD/Blu-ray anime, both new and used figua, and much more. 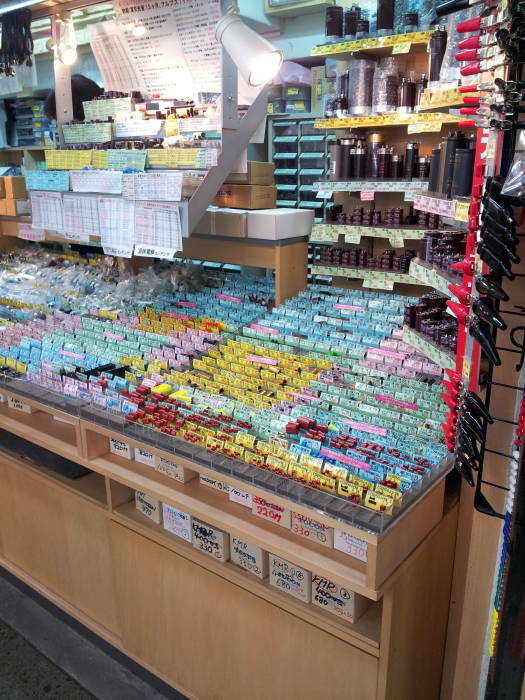 I was in the store for about an hour and a half, looking at the wide variety of goods. I had noticed when I came in that the lighting was very bright fluorescent lights biased toward the blue end of the spectrum. For some reason, we refer to bluer lights as "cool" and redder lights as "warm". However, in the physical universe, yellow into orange and on into red is the result of progressively cooler surfaces. Something hot enough to appear blue is extremely hot indeed. Anyway, after about 90 minutes in the blue light environment, my eyes were fully adapted to the very blue lighting. When I went outside, everything had a murky orange to brown appearance. 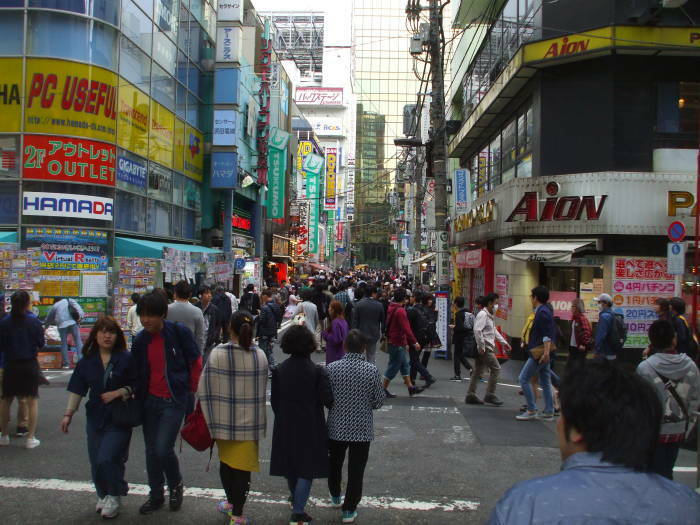 It was like Dust Bowl days in Akihabara. 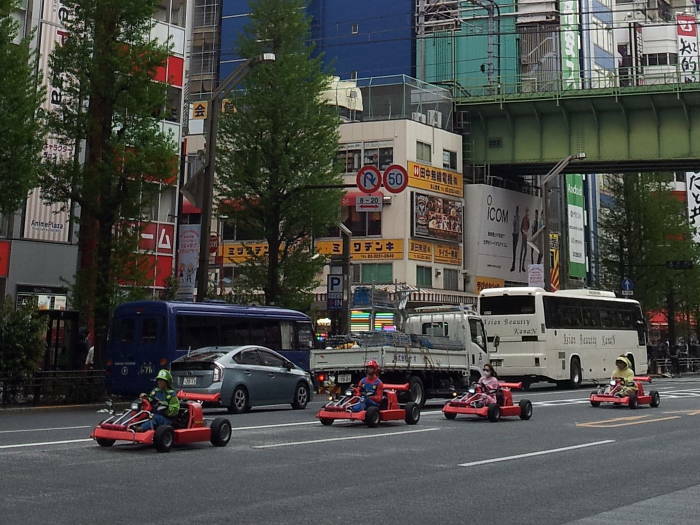 Just before I went on this trip, someone told me, in a very puzzled voice, that they had seen something about people who went to Japan to drive go-karts while dressed as Italian plumbers. Well, yes, that's literally true. But where do you start explaining this, and then where do you stop? Yes, there is a classic video game (or, I suppose a whole series of games but based on one original one, right?) that features a character who, yes, represents an extremely stereotyped Italian man who is a plumber. The game is one of these "moving quest" scenarios, in which the aforementioned Italian plumber must move via a whole series of mechanisms. Running, jumping, driving, etc. All of this while avoiding an angry gorilla. Or maybe it's a row of spaceships that drops down and moves faster. Whatever. Anyway, yeah. 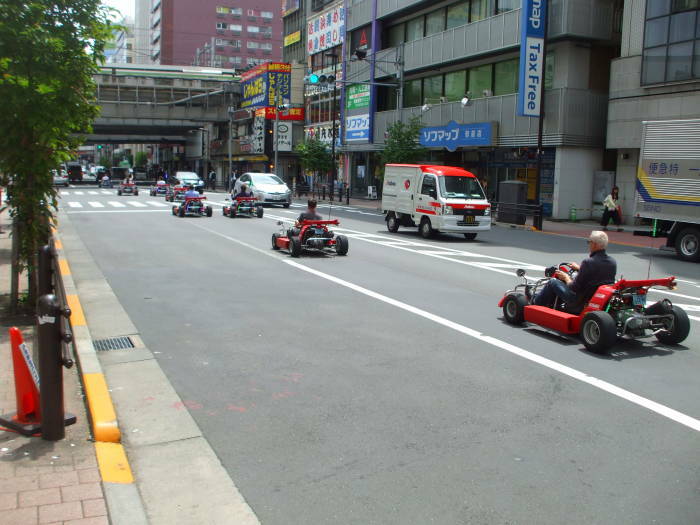 You can go to Tōkyō and rent a go-kart and a costume of a video game character, and then drive around that neighborhood dedicated to anime and manga and cosplay. 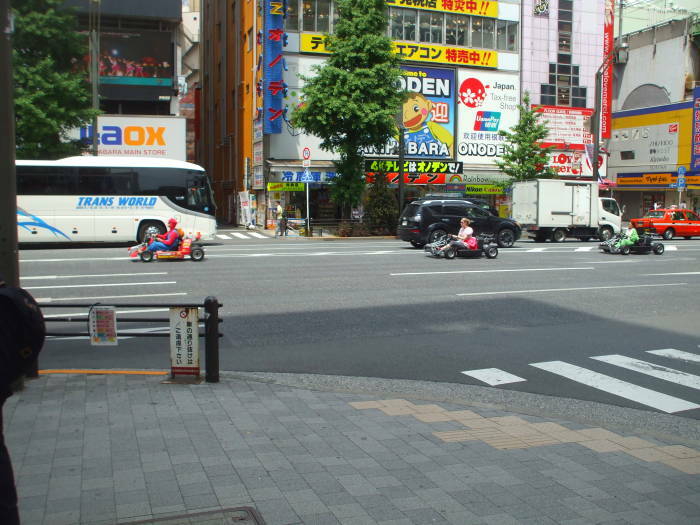 I also saw this in Osaka. But it gets far sillier than this. On my last full day in Tōkyō I walked over the Rainbow Bridge and back. It crosses Tōkyō Harbor. There are spectacular views to either side. 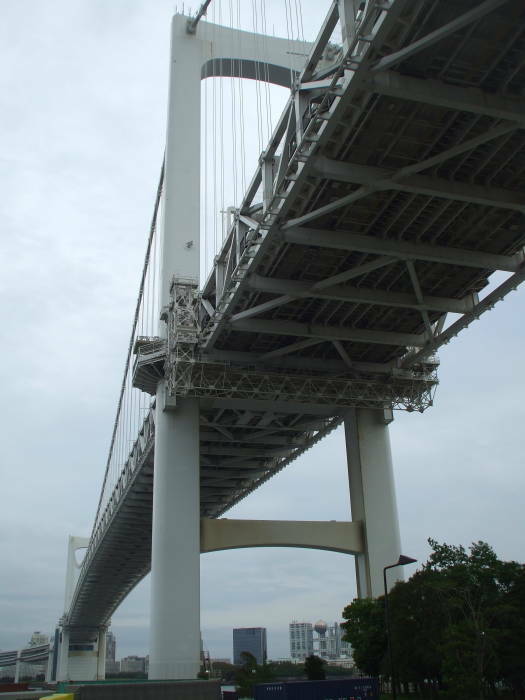 It's 798 meters from end to end, the main span is 580 meters long between the towers. Below, I am crossing outbound, to the east, on the south side of the bridge. The Oi Container Terminal has a total length of 2354 meters. It can hold 7 large container ships at once. The cranes can load or unload one container every 1-2 minutes. 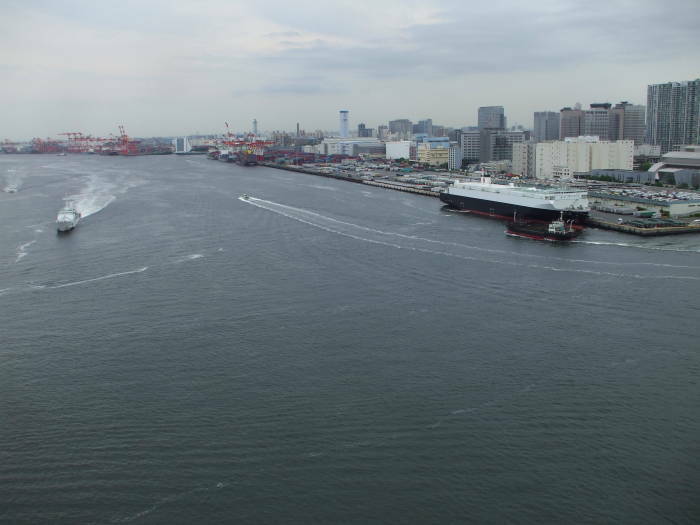 The harbor also includes the Aomi, Shinagawa, and Kamigumi Tokyo Container Terminals with 5, 3, and 1 large container ship berth, respectively. In the pictures below I am on my way back, walking on the opposite side of the bridge. On my way back, looking out to the north over the inner harbor, I noticed something in the road far ahead of me. It had a blinking light, and it was almost stopped. We moved toward each other at walking speed. Ah. 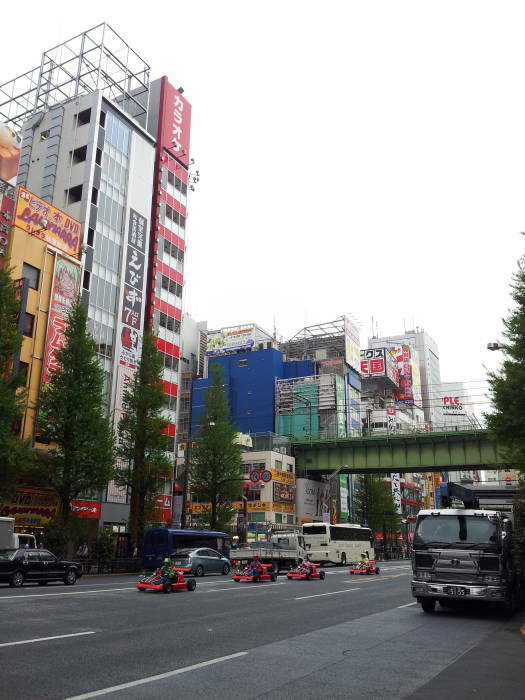 Some go-kart cosplayer has not only left the confines of the Akihabara neighborhood, but he has taken his go-kart onto the expressway over the bridge crossing Tōkyō harbor. I don't know exactly what has happened. Has he run out of fuel? Does the car have a GPS sensor that disables the engine when it gets too far away? 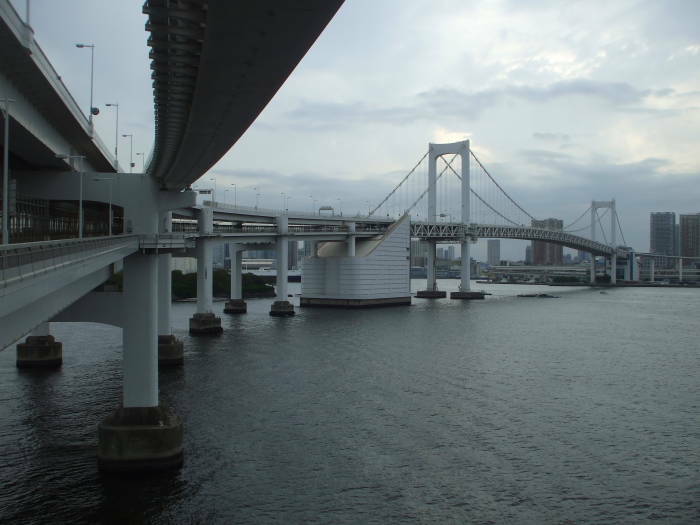 The Rainbow Bridge is about 8 kilometers south of Akihabara. I don't know what is going on. 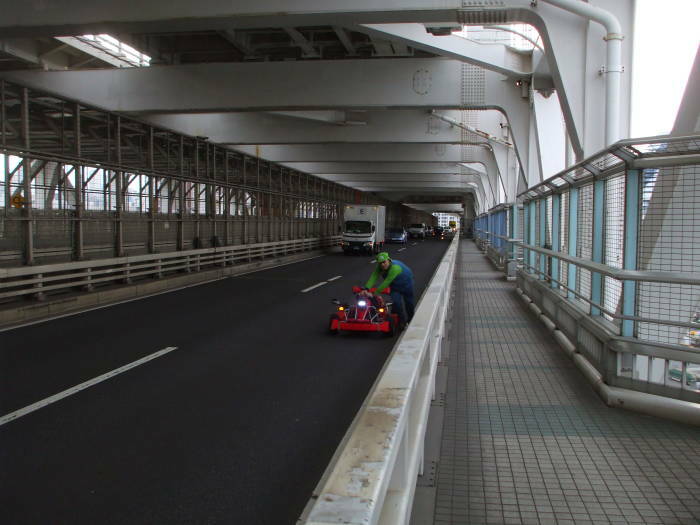 I'm just glad I'm not that cosplayer pushing a disabled car along the expressway crossing the Rainbow Bridge across Tōkyō Harbor.